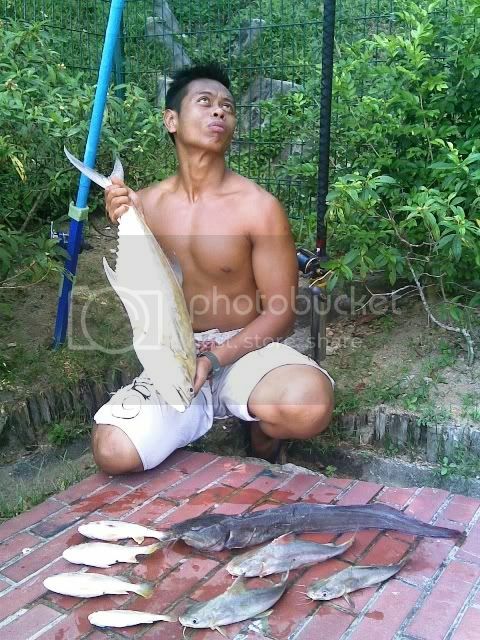 Bait were sarong worms, hook size was size 4 on two-hooked UK Apollo rig (Paternoster rig) - Made in Tampines Ave 4. A surprised CR this time!!! Let's start out the from the main story. Man Kerapu had just returned from Brunei from his two weeks reservist recall. Two weeks in the jungle without fishing was his main sickness since then. 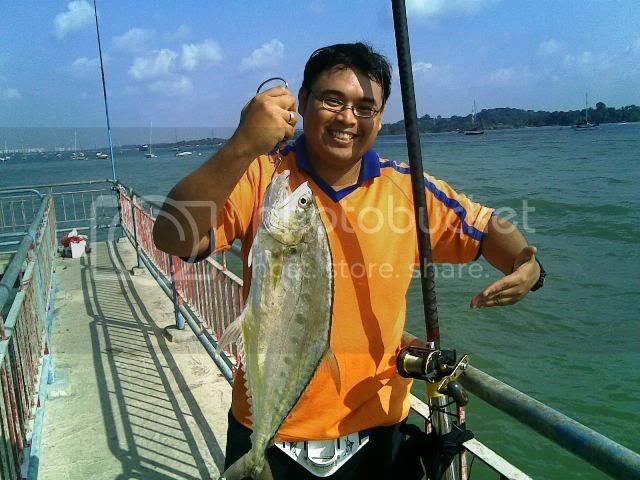 Man called the night before to planned out to fish in Pulau Ubin but due to a last minutes from both sides, we decide to fish at Changi Puaka Beach as we have not visited it for quite some time. Met Man at the foot of my block at around 5pm and off we go to Changi Village to get our supplies and our early dinner. Once reached spot, setup and cast our baits. 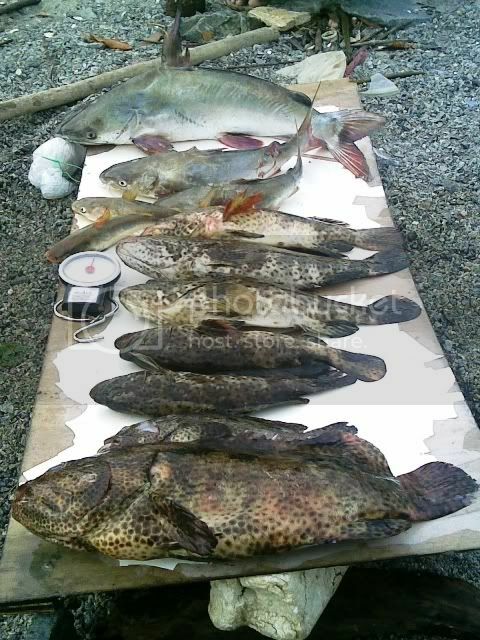 The catches were good when we were starting out but we stopped fishing for the night after 1am. It was only at around 0640hrs that I waked up and continued fishing. At around 0915hrs, when the heat from the morning sun was at an unbearable heat and humidity causes us to take cover at a nearby hut. While chatting up with Man, he saw that my reel drag alarm had gone off and the rod was bending at an angle. Since my knee operation area still have the painful effect since had my operation in January, Man ran to grab my rod first as the line was peeling out fast. We were thinking what kind of fish had took my bait and judging the way the fish fight was just as same as a stingray as it keep playing on the sea bed, but later, when the fish moved up and played at the mid level, we change our thoughts that it could be a good size scaled fish as the bait was sarong worms on two-hooked apollo rig. To our surprised, the fish that took my bait was a Queenfish, I was shocked to see that Queenfish took sarong worms? I thought, they normally goes after prawns and bait-fish? It was a shocking first ever experience for both of us that Queenfish do take worms when they are hungry. 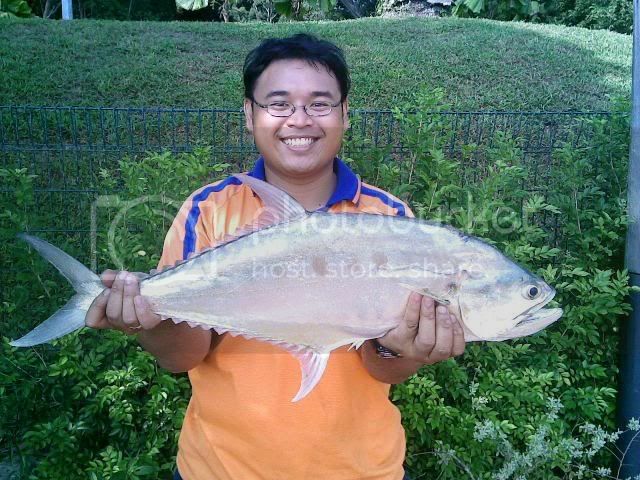 Once landed the Queenfish, it weighs 3kg on my fishing weighing scale. 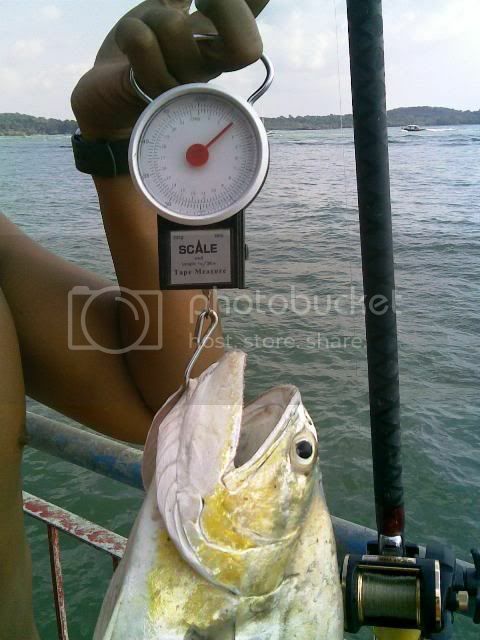 A week before, Uncle Kamsani smsed the rest of the guys to go on a outing to Pulau Ubin on a one day (morning - afternoon) trip to aim for fish points for our tournament. It was one day before the outing that I called Uncle Kamsani to confirm my attendance for the trip. It was at 4.25am that Uncle Sulaiman called to wake me up and get ready to meet the rest at Nadeerah Restaurant in Changi Village by 5.30am. I called my gf to wake her up as she was interested to follow me to Pulau Ubin as this would be her first ever outing to Pulau Ubin. At 4.45am, it was raining cats and dogs which prompted me to call Uncle Kamsani that I might be reaching a bit late depending on the heavy rain situation. Thank God, the rain stopped at 5.15am and off I fetched my girlfriend at her residence and proceed to Changi Village. Along the way, I met Uncle Samsi who was riding his bike and was also going on a trip with us to dig for wat-wat and sarong worms for his fishing trips tonight. Once reached Changi Village, sat with the rest of the guys including with Abang Jaws and wife from Team Jaws 9 having their breakfast together. Bought drinks and meals for the whole day outing and off we proceed to take the bumboat to Pulau Ubin. 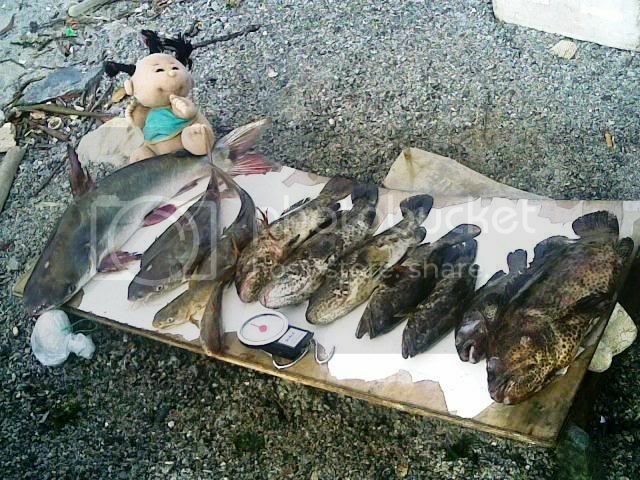 Reached spot at around 6.45am but we didn't start fishing as water was at it's lowest so we just set-up and put all of our stuff nicely as we could see the black clouds around us but thank God it wasn't raining that whole day. While setting up our rod, we chatted and later Uncle Kamsani and Uncle Sulaiman went off to search for wat-wat worms. We only started fishing at around 9 plus in the morning when water was rising up. 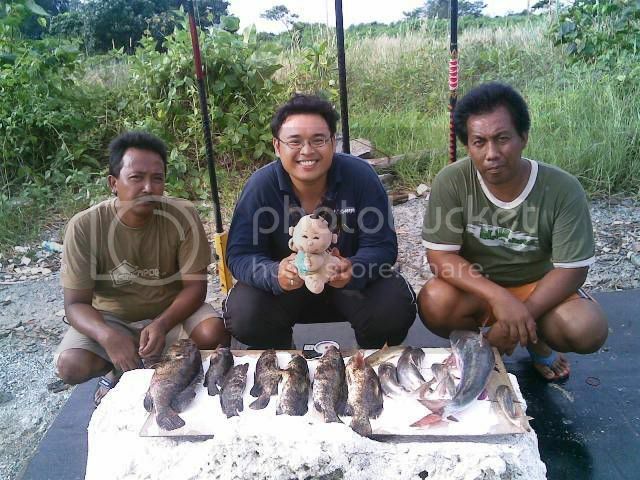 Open ceremony catch was from Uncle Kamsani who reeled in a Duri Belalang and it was followed by me. 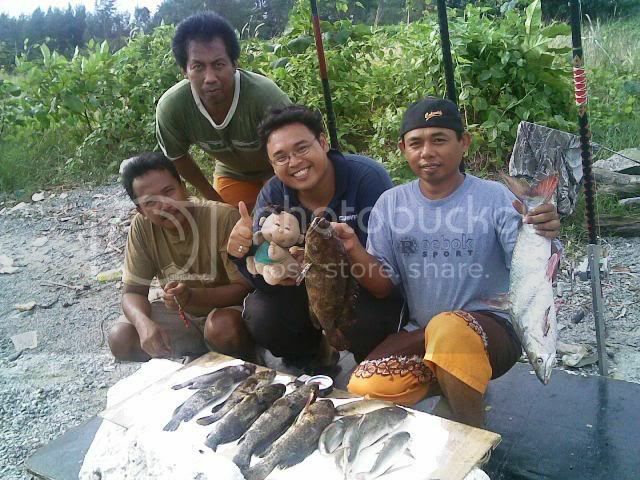 It was consider a slow catch with assortable size Duri and duri belalang being caught till Uncle Sulaiman reeled in a grouper at his spot using whole sotong kelong. 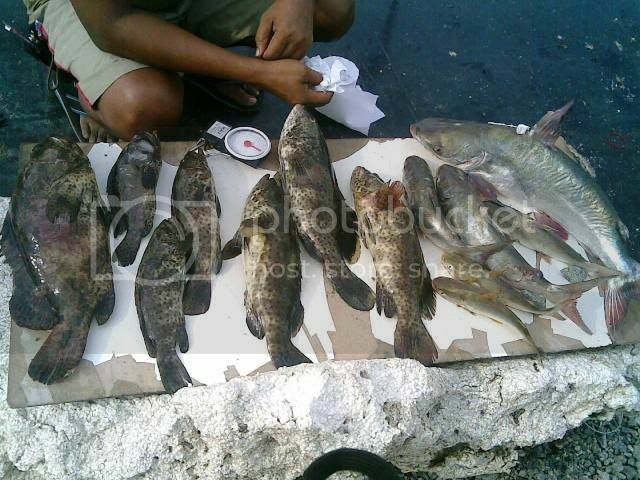 Later, most of us shot to the area where he casted and we were rewarded with grouper too. 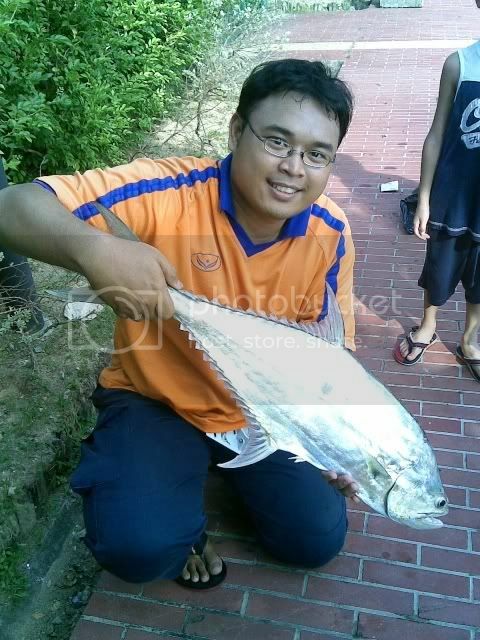 Just before stopping fishing, Uncle Sulaiman caught a 2kg Belukang and released it unharmed as none of us consumes the belukang while Uncle Kamsani reeled in the last duri belalang. 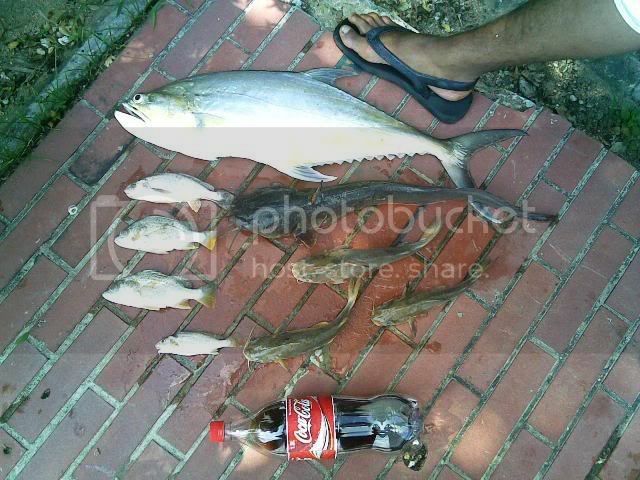 Total catch was 15 but the other fish was not in the photoshoot session.